As a traveling presenter, I have found myself speaking to audiences of all sizes and in rooms of all formats. I’ll never forget one particular presentation where I was speaking to 1,000 middle school students who were getting ready for an all-night party. Needless to say, sitting still was not something they were interested in doing. To make things worse, the auditorium chairs were set up in such a way that when the camera followed me on stage, the front row could see themselves on the screen. What ensued from this point was hand waving and excited laughter as though they had just seen themselves on a jumbotron for a sports team. I quickly learned that audience seating is about more than just chairs – it’s a science to create the most effective space for you to present. At Ethos3, we work with presenters who speak to thousands in an auditorium and those who speak to a few leaders in a boardroom, and we have found that no matter your audience, you must take into consideration the seating, because it matters. Audience seating has the ability to make or break the long-term engagement of your audience. Too comfortable and they may begin to disengage and daydream; too uncomfortable and all they will think about is when they’ll finally be able to leave. But if you can find the right set up for your context, you gain a leg up as you wage war on distraction. Auditorium seating is a great option for keynote addresses or large produced presentations. This format of seating is often the least overwhelming for audience members as they can slip in and out of their seats without anyone noticing. This format is also the easiest when you are speaking to a large audience as the auditorium is likely designed for great viewing from all areas. Auditorium seating should not be used if your audience will not be big enough to fill at least 70% of the seats. With less than 70% of seats filled, your room will feel empty and your audience will subconsciously place lesser value on what you are sharing. 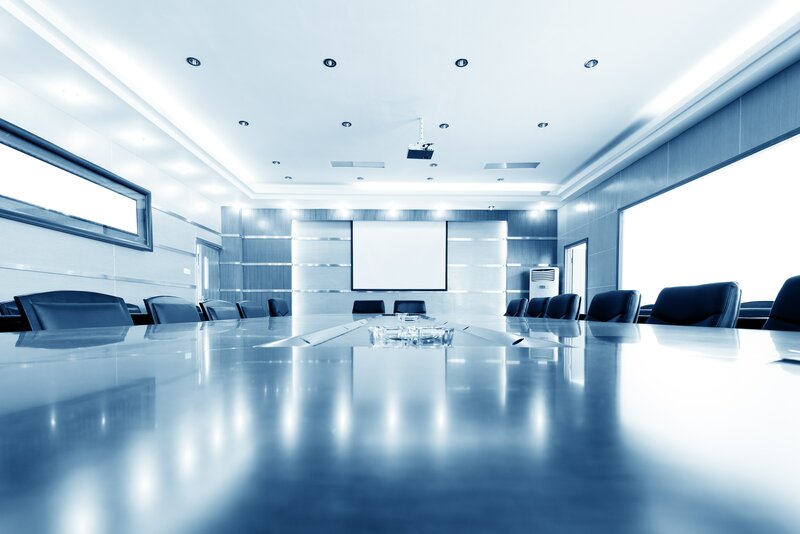 For many presenters, a boardroom is the most likely setting for your next presentation. Whether you are pitching to a new room of investors or looking to close a sale, the chances are that you will find yourself presenting in this smaller, more intimate setting. This style of seating is best used when connection is desired. The intimacy of this setting allows the presenter to connect with each individual and allows room for easy interaction and dialogue. Boardrooms are a powerful tool for connection but at times may feel formal and stiff. Arrive early for your presentation, and ensure the room is cleaned up and ready. If you want to add a personal touch, consider bringing snacks or coffee and arranging them nicely on the table prior to your presentation. Another commonly used seating format is lecture-style seating. Originating primarily in smaller lecture halls on college campuses, this style often consists of rows of chairs sometimes behind tables. This style is excellent for smaller scale meetings and trainings. The ability to move chairs freely allows the presenter to easily engage discussion groups and breakout sessions. The smaller setting allows for an intimate feel while still creating pieces of the anonymousness of an auditorium. Lecture style is a happy medium for many presenters; however, if not set properly, this format of seating can result in poor sight lines which ultimately can lead to disengagement. If you choose this format, ensure that every chair in the room can see both the presenter and the screen clearly to prevent this distraction. As a presenter, you must think through every variable and possible distraction in order to deliver the best presentation possible, and while it may not seem like it at first, seating is one of those variables. There are many options available, but these three are guaranteed to create a fun and engaging environment for your next presentation. Looking to learn more about how to present with excellence? Contact us today to speak with one of our presentation coaches!